Two novels by prolific, award-winning Israeli authors that consider the intimacy of violence have now been released in the US. Dalya Bilu has masterfully translated both books, capturing the dreamy, impressionistic writing of The Sound of Our Steps by Ronit Matalon (Metropolitan Books, $35) and the chatty, deceptively casual first-person narration in Lies, First Person by Gail Hareven (Open Letter, $15.95). The Sound of Our Steps is an enthralling autobiographical novel that recreates the insular environment of Matalon’s childhood in a resettlement town in the 1950s and 60s. Built on a scaffold of short, associative chapters, the book weaves through time and multiple perspectives to illuminate the lives of an Egyptian immigrant family that has been dropped into the alien landscape of Israel. At the novel’s heart stands Lucette, abandoned by her husband and supporting three children on her job as a cleaning woman. A former beauty, she has been coarsened by her work and circumstances and emerged as the force that both attracts and repels those around her. Always at risk of flying into an unpredictable rage, Lucette vainly attempts to impose order on her chaotic and uprooted life through the violence she directs at her children and on the shack in which they live. Constantly reorganizing furniture and walls, trying to plant roses in the inhospitable dirt, angry at any mess, Lucette is nevertheless the source of stability for her children, especially the youngest, most often referred to as “the child,” who watches and records the small, intimate moments of family life that define her youth. 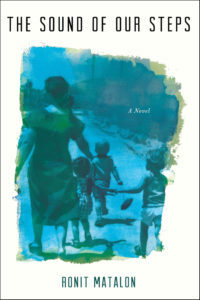 Although the novel never strays far from its tight focus on the family, it tells a larger story about loss and displacement: Lucette, who never masters Hebrew, has been irreparably changed by her immigration, and Maurice, her immoral and wayward but charming husband, cannot let go of his former identity as a fully integrated Jewish Arab in Egypt. It’s in Israel, dominated by Ashkenazi “Ben-Gurionists,” as he calls them, that he feels alienated, driven to leave the country to escape the second-class status that so humiliates him. Set almost entirely in Jerusalem, Lies, First Person, reveals a different Israel. A compelling meditation on obsession and evil, the book moves from the light of Paradise into shadowy noir. In fact, Elinor Brandeis, the protagonist and narrator, describes her life — comfortable, middle class, married to a good man, two successful grown sons — as the Garden of Eden. Which means, of course, that a serpent is bound to slither in. The obvious snake here is Aaron Gotthilf, a relative of Elinor’s father who came to the family’s run-down hotel when Elinor and her sister, Elisheva, were teenagers in order to write a book — Hitler, First Person — that would ultimately destroy his reputation and career. In the process, he sexually violated and dehumanized sweet and slightly developmentally delayed Elisheva, and then arranged an abortion after impregnating her. This whole sordid past — including their parents’ dysfunctional responses: first disbelief, then their mother’s suicide by way of heart medication and their father’s exit to Italy with one of the hotel’s visitors — rears its head when Gotthilf returns to Jerusalem as part of a tour of repentance, in which he publicly renounces his book. But not his own sins. The novel is remarkable for what it insinuates as much as for what it says. After many years, Elinor reunites with Elisheva, who has moved to Illinois and become a devout Christian, which allows the novel to juxtapose both the flat landscape of the American Midwest, which hides nothing, with the hills and crevasses of Jerusalem, where secrets and tensions germinate, as well as measuring the Christian ideal of forgiveness against Jewish notions of justice and the demands of history. Although Elisheva has come to terms with her past, Elinor cannot follow suit. Consumed by the need for vengeance, she descends into the pits of mad obsession, and, like Gotthilf before her, comes to enact the very evil she attempts to stamp out. The reader is left with some doubt, though. 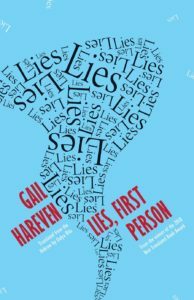 After all, in a book called Lies, First Person, the first one we doubt is the narrator herself. And while the novel plays with narrative, offering different versions of events only to retract them in favor of more “truthful” tellings, the entire edifice crumbles under the weight of its own testimony. Like the best noir films, we are taken into the dark labyrinth of a person’s mind, so when the sun finally shines at the end, we can’t tell if all has been illuminated or if we’ve been blinded by the sudden light.